Time to get in touch with your inner bogan, we’re off to Summernats with our own set of wheels, our TERO Camera Car. For the uninitiated, Summernats is the biggest car lovers festival in Australia held in Canberra each year. From exquisitely restored cars, souped up street machines and massive burnout contests, it’s a revhead’s paradise. Our TERO is a completely new way to move the camera. 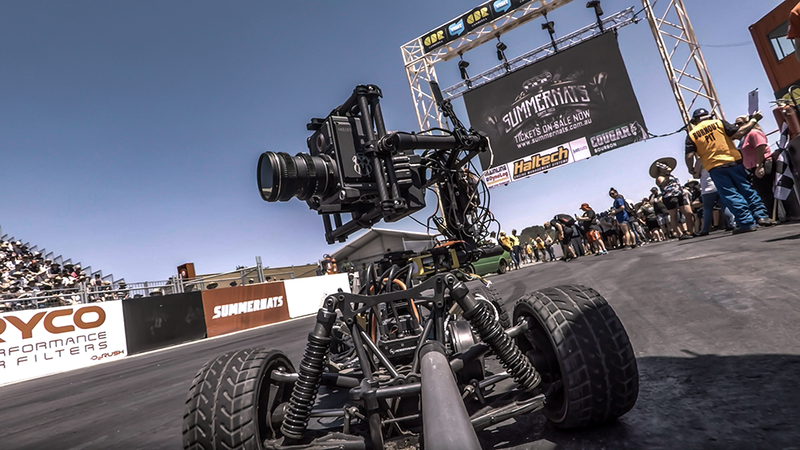 The system allows for an extremely dynamic low camera angle coupled with full 3-axis control of the MōVI stabilizer gimbal to create never-before-seen shots. With the custom vibration isolation system on the car as smooth and agile as this, you’ll rethink what is possible from a chase car. Think off it as a mobile, extremely long, all terrain, any direction camera dolly. See our Behind The Scenes video above to see the TERO in action. This was the the ultimate “run and gun” shoot. Non stop for 3 days, the TERO was great for getting in quick and getting some amazing smooth stable shots from a new point of view. If you’re interested in learning more about what we can do for you drop us a line, we’re always open to discussing innovative ways in which to help you achieve spectacular images. You can see more examples of our work on our portfolio page here.